The Primates are a group of mammals including like lemurs, lorises, galagos, tarsiers, monkeys and apes. We as humans also belong to this group. Most primates can be found in tropical or subtropical forests in America, Africa and Asia. There are some examples of primates (other than humans) that live outside the tropical forests. For example, the mountain-dwelling Japanese Macaque lives in the north of Honshu which is covered with snow for 8 months in a year! The Barbary Macaque lives in the Atlas Mountains of Algeria and Morocco. Some primates live on high mountains. For example, the Black Snub-Nosed monkey lives in the Hengduan Mountains at altitudes of 4700 metres (15400 feet). The world’s biggest primate, the Mountain Gorilla, is found at 4200 metres (13800 feet) in the Virunga Mountains. Most primates do not like to swim but a few of them are good swimmers and are comfortable in swamps and watery areas. For example, the Allen’s Swamp monkey has slightly webbed fingers to help it to swim. Finally there are also some monkeys which live near us. For example the Rhesus Mascaque which live close to human settlement. The smallest living primate is Madame Berthe’s Mouse Lemur which weighs only 30 grams (1 ounce) and the biggest living primate is the huge Mountain Gorilla which weighs about 200 kilograms (440 lb). The biggest ever primate is the 3 metre (10 feet) tall Gigantopithecus. Some primates do not mainly live in trees but they live on land too. For example, the great apes and baboons. Most primates are able to climb trees. They are able to leap from tree to tree, walking on 2 or 4 limbs, knuckle-walking and swinging between branches of trees. Bushbabies cling to vertical tree trunks and then leap! Spider monkeys move around by swinging from a tree branch to another tree branch. Orangutans move around by using their arms and legs to carry their heavy bodies through the trees. Chimpanzees and gorillas will do a knuckle walk and they are able to move on two limbs for short distances. Primates have large brains compared with other mammals. They have two eyes located side-by-side in front of their heads. These work together to allows them to locate objects accurately. Animals like fish and horses do not have eyes like primates. Most primates have opposable thumbs which helps them to grab things easily. Some have tails which they can use to grasp or hold onto tree branches while feeding, digging or protecting themselves from predators. Some primates choose to live alone, others live in pairs and others live in a big groups. Primates’ eyes face forwards. They have 5 fingers or toes on each limb, with nails on the end of each finger or toe. The bottom sides of the hands and feet have sensitive pads on the fingertips. This means that their fingertips are sensitive to pressure, temperature and pain. The primate’s collar bone is built in a way which allow great movement. Primates grow up more slowly than other mammals the same size. They live longer – especially the females. 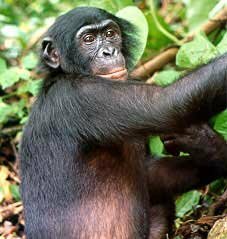 All non-human primate infants are breastfed by their mother and the babies depend on their mothers for grooming and transportation. In some species, infants are protected and transported by males in the group, especially if the males are their fathers. The siblings and aunts may also help to take care of the babies. The primates gain their social and fighting skills through playing. Most primates eat fruits, leaves, gums and insects. For example, howler monkeys eat leaves. Marmosets eat gum – they have strong incisor teeth which enable them to open tree bark to get the gum. 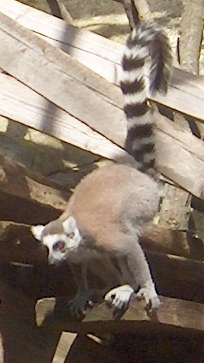 It has claws to help them to cling onto trees while feeding. The Aye-aye has rodent-like teeth, and a long, thin middle finger. It will tap on trees like a woodpecker to find insect larvae. Then it will chew up the holes in the wood and put its long thin middle finger inside to pull out the larvae from the tree. Some primates, such as the Grey-Cheeked Mangabey has thick enamel on its teeth which will help them to break open tough fruits and seeds that other monkeys can’t open. The Gelada is the only primate species that mainly eat grass. Tarsiers eat insects, crustaceans, small vertebrates and snakes – including venomous snakes! Capuchin monkeys eat all kinds of food like fruits, leaves, flowers, buds, nectar, seeds, insects and other invertebrates, bird eggs and small vertebrates such as birds, lizards, squirrels and bats. The common chimpanzee has a wide range of diet including other monkeys, for example, the Western Red Colobus monkey. The International Union for Conservation of Nature (IUCN) has listed more than a third of primates as seriously endangered. Most of them are endangered because of the deforestation, the killing of large number of wild monkeys to protect agriculture, illegal hunting for use in medicines, as pets and for food.